View our mens rings here. Women are known to wear jewelry more often than men and the stereotype is that women care more about wedding rings than men do. However, that presumption is changing as more men become interested in mens wedding rings. It’s no longer just the bride who cares about having a beautiful wedding ring. Grooms are also concerned with having beautiful rings. As a result, jewelers are creating beautiful mens wedding rings to rival those made for women. Men haven’t always been interested in wearing men’s wedding rings. During World War II, it became more acceptable for men to wear wedding rings. Men wore them prior to that time, but it wasn’t all that popular among men. But married soldiers began wearing wedding rings to remind them of their wives. It’s said that the soldiers viewed their rings as symbols of what they were fighting for. After the soldiers began wearing rings, more men outside of the military felt comfortable doing the same. It was no longer thought of as feminine or a woman’s thing. Men’s wedding rings became more popular, and have continued to grow in popularity over the years. However, there is a distinct difference between men’s wedding rings and those made for women. What determines if a ring is for a male or female? Usually, the style in which it is made provides the answer. Traditional men’s wedding rings are usually made from white or yellow gold, or platinum. They are also usually thick bands set with diamonds or other precious stones. 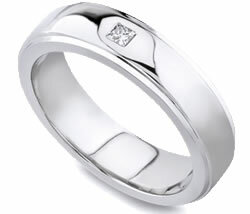 You will see many men’s wedding rings with intricate designs engraved. Milgrain and braid are two very popular choices for men. The styles are beautiful, but not overstated. You would be hard pressed to find any men’s wedding rings that use the same styles as women’s rings. However, the choice is dependent upon the groom’s taste. A man could very well choose a ring designed to be worn by a woman. But most grooms just want a simple, attractive ring that can be worn on a daily basis. There is no specific definition of what type of ring is best for a man, but there are certain things to consider when looking at men’s wedding rings. Lifestyle, for example, is a very important factor. The type of wedding ring a man wears depends heavily on his lifestyle. The type of work he does may have a bearing on the type of ring he wears. If he plays a lot of sports, that should also be taken into consideration. But with that said, most men simply remove their rings during strenuous activity. At Novori Jewelry we have select a variety of mens ring styles to suite any taste. Today, choosing matching wedding rings is also an increasing trend. But choosing men’s wedding rings that are similar to the bride’s may limit the choice. The reason for this is that most women prefer to wear multi-design and diamond embedded rings; whereas, men prefer simple wedding bands. However, since there are so many options available online and in retail stores, the groom shouldn’t have trouble finding a ring to match the bride’s ring.